Do you want your kids to live longer? Do you want your children to lose their memory? Are you a happier parent when your kids sleep better? If you answered yes, no, yes, then continue reading. If you answered any other combination, then it is time to rethink your parenting strategy. My new book, Maury C. Moose and The Ninja Worrier. Okay, so maybe the book itself may not have magical powers, but the book’s message is powerful. What is this message, you ask? The story is all about finding your purpose. Frankl, an Austrian neurologist and psychiatrist, made this discovery as an Auschwitz concentration camp inmate during World War II. This was a horrific time during which he lost his wife, his mother, his brother and many friends. Life was about as miserable as one could imagine. No one would have faulted Frankl for giving up. But he did not. Mainly because, despite his many losses, Frankl did not lose one thing: his purpose. He found purpose in his approach to psychotherapy and his work of helping others find meaning. This got him through even the most unbearable circumstances. If that isn’t enough, purpose may even reduce the risk of Alzheimer’s and help us live longer. That is right, finding your purpose may just add a few years to your life. So How Do We Find Purpose? I first read Man’s Search For Meaning in college. I was just about to graduate, and was thinking a lot about my future. Learning about what Frankl experienced, discovered and spent the rest of his life teaching others, was eye opening. Frankl’s book isn’t the only one written about purpose. A quick Goodreads’ search will bring up dozens of titles dealing with the subject. You will find bestsellers from Rick Warren, Brene Brown, and Jack Canfield — authors who have sold hundreds of millions of books. But you know what you won’t find? Like I said, Man’s Search For Meaning is a favorite of mine — I greatly benefited from having read it. But would I ever ask a 9-year-old to read a story about an Auschwitz concentration camp? No way! Sure, a 9-year-old would definitely benefit from the message of the book, but the packaging is all wrong. It would be like asking a man to learn he is going to be a father by going on the Maury Povich show, rather than having a meaningful conversation with his wife. The result would be scarring and the message would be lost. So it is clear that books are a great way to teach the importance of purpose, but what do we do if our kids are too young for the mature way the content is presented? Enter Maury C. Moose and The Ninja Worrier. 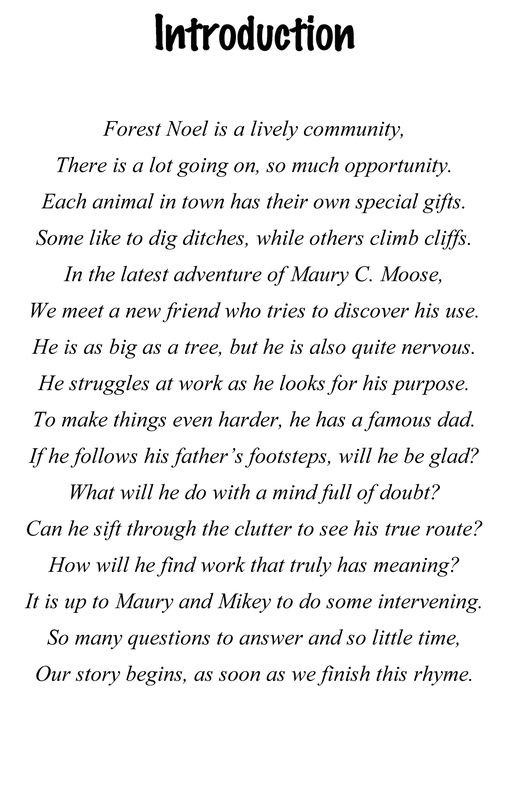 My new book touches on the topics of purpose and meaning and does so via rhymes, jokes and by introducing a new character to the whimsical world of Forest Noel. Our new friend, Sam R. Rhino is fresh out of school and looking for what he will do next. He struggles to decide whether to blaze his own path or to follow his famous father. How will Sam deal with this important decision? Will Maury and Mikey be able to help him find his purpose before it is too late? These are important topics, yes, but they are framed in a story that children will relate to. By sprinkling in some puns, pictures and practical tips, the kids will enjoy the story and more easily absorb its message. No matter how you put it, the message is a very important one — one that kids (or people of any age) need to hear. If you are a parent, I encourage you to check out the book. Help your kids learn the value of finding their purpose. It may just add a few years to their life. Today’s THE day! How excited are you?! One book is impressive but 3 is incredible! Congrats!